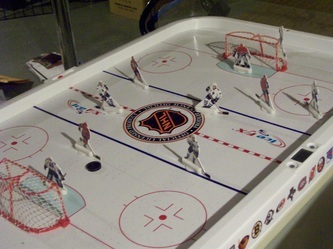 customized, restored, new and vintage table hockey games of your choice are put on display for your enjoyment. Each game can be played at your discretion. 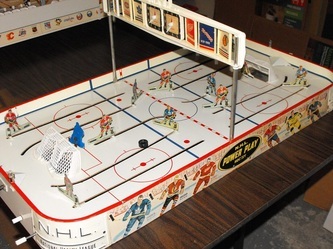 There will also be opportunities for the guests to win hockey prizes by either answering hockey trivia questions every 15 minutes or scoring 1 goal on the Party Pucks attendant before he scores 2 goals. This party also has the option (at no extra cost) to include a short 20-30 minute single elimination tournament with prizes for the top two finishers! 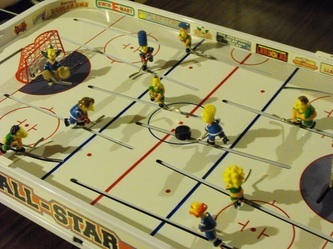 For Children's parties, all the guests will receive a small prize (a Party Pucks gift pack consisting of hockey cards, candy and a hockey toy) and the guest of honour will leave with a customized hockey player with his/her name emblazoned on the back as a memento of a wonderful day of table hockey! *For SILVER MEDAL PARTY Prices CLICK HERE.